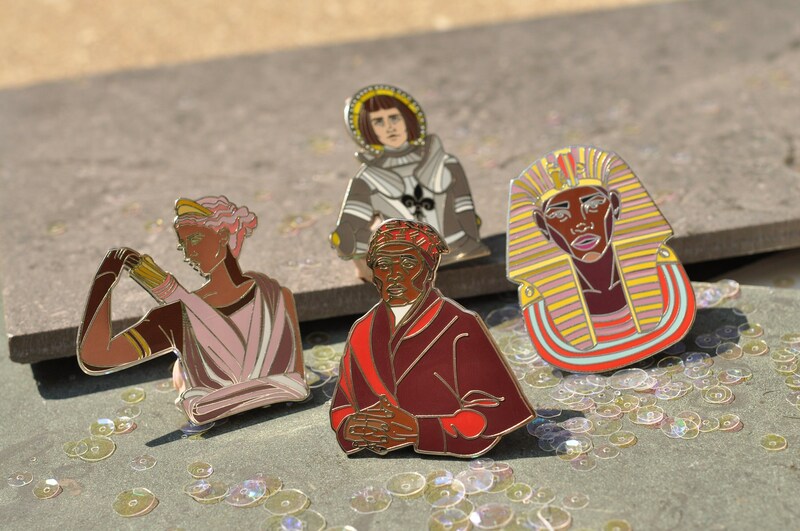 High quality hard enamel pin depicting a less traditional form of warrior- Harriet Tubman, who fought for abolition of slavery, humanitarianism and women's suffrage. Tubman's work wasn't purely symbolic: she put her thoughts into action by becoming an undercover spy for the North during the Civil War and helping to establish and free enslaved people throughout the United States. Born into slavery herself, Tubman escaped to Philadelphia and devoted her life to rescuing her family, friends and strangers from slavery. Called 'Moses" by many of her grateful devotees, Tubman was the first woman to lead an armed expedition in the war, and freed over 700 slaves during her tenure. We've chosen to depict this woman warrior for her service to her country, her fellow man, and American history.